Part 3 in Bert’s review series, the Swiss Military Conger Dive Chronograph. 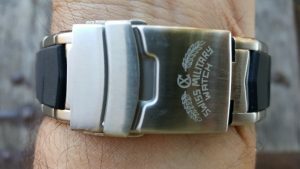 Swiss Military and CX Swiss Military brands go all the way back to 1926 when Montre Charmex SA founder Max Bürgin started his watch apprenticeship in a leading watch manufacturer near Basel Switzerland. Working up through the business eventually lead to his dream of forming his own watch company. 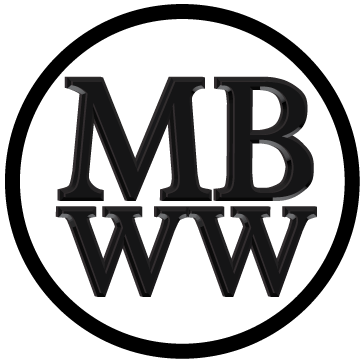 By 1989 his son Manfred and his wife Kathleen joined the business and in 1999 their son, Frank M. joined and who today is the CEO running the company. Currently the watch line is divided into four groups; Navy, Airforce, Army and now Motorsports. The Navy line is the largest and goes all the way up to the 20,000 ft or 6,000 meters, a world record holder. Needless to say, Montres Charmex SA builds watches to the highest standards and takes no shortcuts. The model for this review is the Conger, named after an eel like sea predator that reach up to 10 feet in length and is known to attack divers with it’s razor sharp teeth! The Conger is a 2,000 meter extreme diving chronograph, available in your choice of yellow, blue, silver or black dials. All Congers use a Swiss made Ronda 5030, 13 jewel quartz movement. My example has proven to be extremely accurate, gaining at most a 1/2 second a week. If you don’t use watch winders and wear different watchs, this is a blessing, eliminating the need for constant setting and winding. 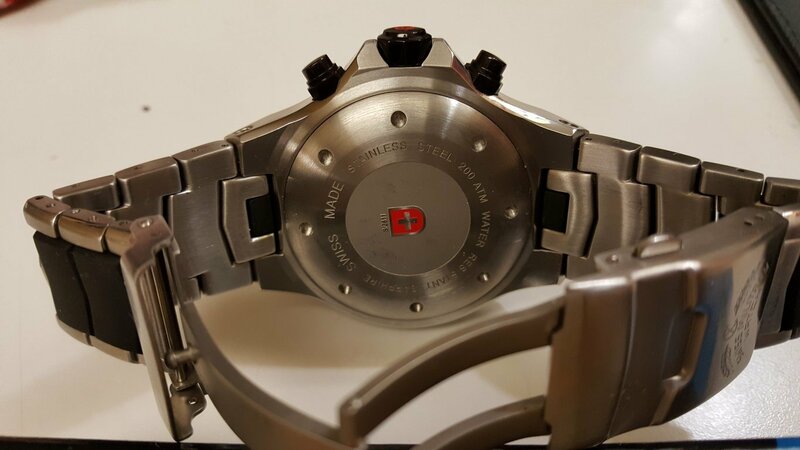 The first thing I noticed about this watch is it’s vault like construction, large size and weight. 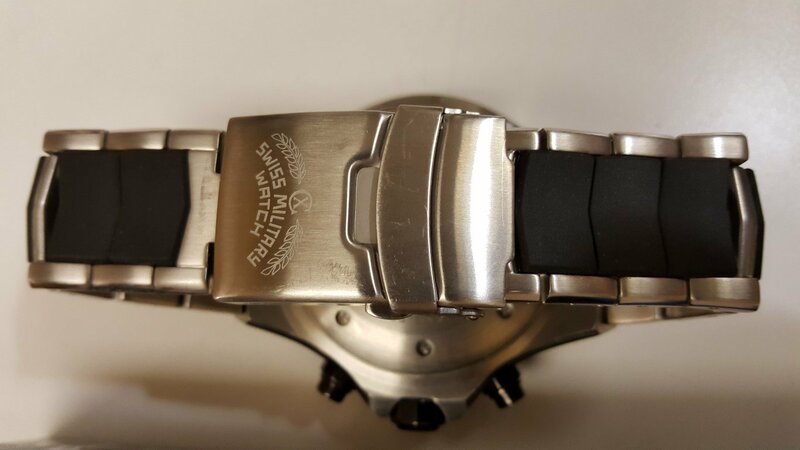 The watch is 48 mm x 18.5 mm and weighs 305 grams with the full bracelet. 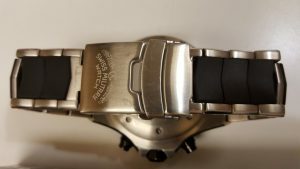 The two tone stainless and rubber bracelet is 170 mm x 22 mm and includes a very solid safety butterfly buckle and a diving extension. 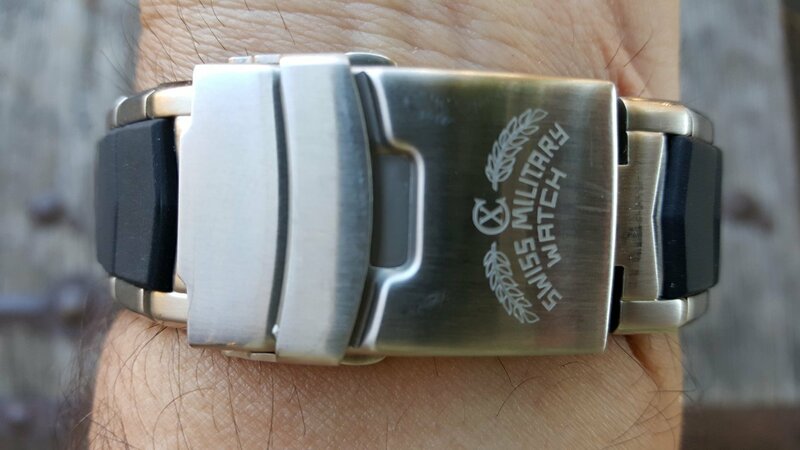 Every component of this watch is finished and shaped to perfection, including the engraved Swiss shield stainless steel screw down case back. The 60 click unidirectional bezel has ISO6425 rated luminous markers while the crown and pushers are screw down. The pushers and crown are completely finished in a durable black finish with the red swiss shield on the end of the crown. The sapphire crystal is antireflective and the watch even includes a helium relief valve at the 9 oclock side of the case. Two of the three subdials measure cumulative minutes and hours respectively with thin hands finished in bright red. The third subdial runs continuously to count the seconds with an indentical hand finished in white. 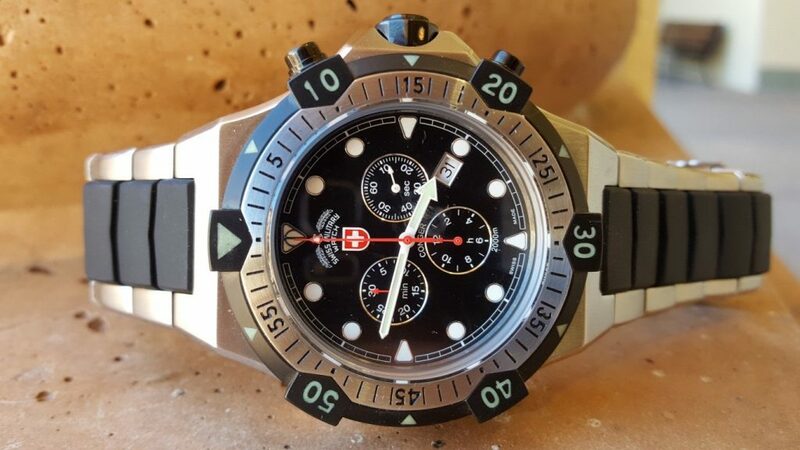 The main chronograph second hand is also bright red with a small lumed triangle near the sharp tapered tip. All three subdials are finely finished with concentric circles within their borders. The silver framed black on white date window is well placed at 4 pm. The white railroad track second markers circle the outer portion of the dial while the highly lumed sword and arrow minute and hour hands work perfectly with the 12 luminous hour markers. All lume used on this watch is outstanding. The silver edged three, six and nine o’clock markers are sharp tooth shaped while the 12 o’clock marker has a silver circle and vertical line within it’s triangular border. Branding is tasteful and discrete, in my opinion. All in all, I couldn’t ask for any more attention to materials, detail and fine finishing on a watch of this type. 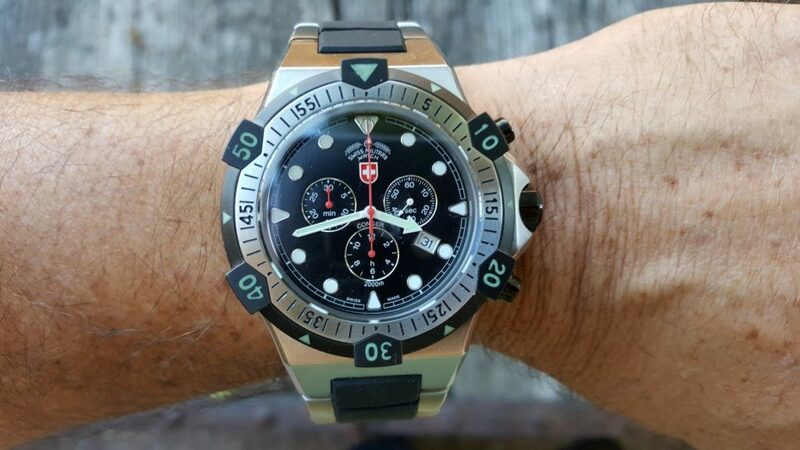 A great looking tool watch. Well done ! Even as a fan of 3-handers, I like this piece.